The case was about a wind turbine to be erected by a homeowner in a residential neighbourhood. 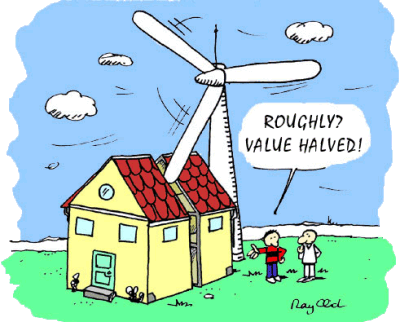 "The main complaints about the wind turbine were its likely noise, the impact it would have on the neighborhood aesthetics, the “shadow flicker” caused by the turbine, and also the price impact on home values. The evidence showed that this was a quiet neighborhood and that the wind turbine would substantially impact the neighborhood, not only because of its noise and size but also the negative financial impact it would have on the properties. Therefore, the (Supreme) court upheld the permanent injunction barring Sowers from constructing the wind turbine in the Subdivision because the factual evidence supported the finding that this wind turbine constituted a nuisance-in-fact."